Salmon: king of the icy Alaskan waters, sweeping majestically through impossibly clear glacial runoff and leaping up waterfalls in the self-sacrificing quest to ensure the survival of its young – or genetically modified Frankenfish, packed into squalid farms that stain those beautiful waters with a torrent of toxic waste, and injected with dye after harvest to mimic a natural pink color? Statistically, salmon is America’s third-favorite fish (after shrimp and tuna), and for good reason. Not only is it delicious, but it’s also much more nutrient-dense than white fish like tilapia, and completely deserves all its good press. On the other hand, it also has the dubious distinction of being the first genetically modified animal intended for human consumption, and the actual conditions of salmon farms are often very different from the idealized Alaskan scenery most of us like to picture. This doesn’t mean you should avoid salmon altogether. It just means that choosing your salmon wisely is important. This isn’t just an issue of environmental justice or animal rights – although that would be reason enough to avoid farmed salmon – it’s also a question of health. Wild salmon is just so much more nutritious that it’s hard to even justify paying for the farmed version. There’s a whole lot of “good” to a piece of salmon. 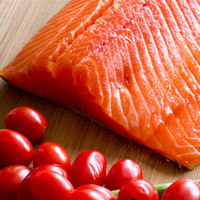 The first benefit everyone thinks of is the Omega-3 fats: like other seafood, salmon actually has more Omega-3s than Omega-6s, which makes it extremely anti-inflammatory and a delicious corrective for the high levels of Omega-6 typically found in the modern American diet. Omega-3s are also important for mood, brain health and cognitive performance, muscle growth, and overall reducing inflammation and oxidative stress: they’re just good news in general, and most of us don’t get enough of them. On top of that, salmon is high in B vitamins, magnesium, potassium, phosphorus, and selenium, with smaller amounts of other nutrients as well. The selenium is particularly important, because it helps protect against any mercury that may be present in the fish: as long as the selenium is there, there’s nothing to fear from mercury poisoning. If you get the canned kind with bones included, salmon also provides you with a hefty dose of calcium: almost 1/3 of what you need for the day in just one serving of fish. And don’t forget the iodine content, either – iodine, a mineral found in anything from the sea, is important for thyroid health and especially beneficial for pregnant women, who need a lot of it to support the growing baby’s brain development. Overall, a big piece of salmon is one of the healthiest things you could eat – it’s on par with grass-fed meat for nutritional value. And unlike beef, salmon is a food that almost everyone perceives as “healthy,” so if you’re cooking for a crowd of non-Paleo friends, it’s a choice the whole group can agree on. The downside to all the nutritional benefits above? They aren’t just in any old package of fish labeled “salmon.” To actually get the health benefits you’re looking for, you’ll need to find a wild-caught fish. Most (roughly 80%) salmon sold in the United States today is farmed salmon, which means it was raised in the fish equivalent of a factory farm. The ethical issues would be bad enough, but farmed salmon just doesn’t hold a candle nutritionally to the real deal. First up are the fats. 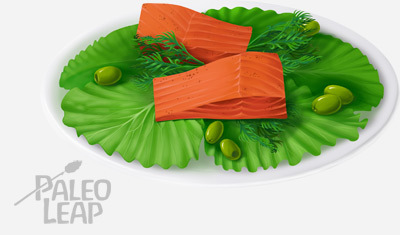 Remember how the high levels of Omega-3 fats are one of the great benefits of salmon (and seafood in general)? That’s all true, but if you want to take advantage of them, you’d better find a wild fish to eat. In this study, the average wild-caught salmon had 12.4 times as many Omega-3s as Omega-6s, while the average farmed fish had only 2.9 times as many. By weight, wild salmon is just 2.1% fat, while farmed salmon is 12.3% fat. If you do the math here, you’ll realize that farmed salmon has a more or less equivalent amount of Omega-3 fats (thanks to its higher overall fat content), but a much higher dose of inflammatory Omega-6’s along for the ride. So from a fatty acid perspective, wild-caught fish is unquestionably, and relevantly, superior. Then there’s the micronutrient content. According to one set of experiments, farmed salmon only had 25% of the Vitamin D as wild. Per ounce, wild-caught salmon had 988 IU, while farmed salmon had only 240 IU. Like the Omega-3 content of the fish, this is an especially important point because fish is one of the few foods that naturally provides Vitamin D. So another unique benefit of seafood is seriously reduced if you’re eating farmed salmon. Another problem with factory-farmed salmon is the higher rate of toxic contamination. According to this study, farmed salmon had higher levels of 14 organic contaminants, including PCBs, dioxins, and DDT. These toxins were so alarming to the researchers that they recommended no more than 1 (and sometimes less) meal per month of farmed salmon, even though the typical recommendation for wild salmon was 4-8 meals per month. On top of all that, there’s also the GMO issue. Salmon are actually the first genetically modified animal intended for human consumption, a development that carries with it a whole raft of concerns about food safety, ethics, local ecosystems, and biodiversity. These new genetically modified fish (called AquAdvantage salmon, because they grow faster than their traditional cousins) aren’t on the market yet, but keep an eye out for them in the future. Of these, Alaska is your best bet, for the combination of nutrition and sustainability. A hint for finding wild-caught fish: if you get salmon in a can, it’s almost always wild. This is because farmed fish doesn’t stand up very well to the canning process, so wild-caught is really the only option. It’s convenient for budget-conscious consumers, though, because canned salmon is typically cheaper per pound than even the cheapest fresh fish. For most people, canned salmon is the most affordable way to get all these health benefits, and the convenience is a great additional bonus. If you do have to go with a farmed fish, definitely go with one from the Americas: they’re not fantastic, but they’re a lot better than farmed salmon from Europe. It’s true that wild-caught fish is more expensive than farmed. But considering the remarkable health benefits of the wild fish, it’s worth your money here to eat salmon less often and make sure to get the good stuff when you do. Remember: you’re voting with your dollars here. If producers see an increased demand for wild salmon, they’ll have an incentive to develop more humane and natural ways of getting the fish from the ocean to your table, but if they see everyone willing to accept an inferior farmed product, they’ll have no reason to change what they’re already doing. If you’re going with canned, try your fish on top of a salad like this one. Alternately, you can buy the half-size cans and just bring the whole can to work for a simple but tasty lunch option. Top it off with a little balsamic vinegar and add some vegetables or a piece of fruit to go with it, and you’re all set with a mid-day boost of protein, healthy fat, and nutrients to keep you going through the afternoon. Canned salmon also makes a delicious pantry staple to have waiting in the back of your cupboard just in case you need a quick dinner on the run. No time to cook? No problem; dinner is right there at your fingertips, even faster than a takeout pizza would have gotten there. The moral of the story: don’t waste your time or your money on farmed fish. It’s just not the same, and it’s also sending a message of support to a cruel and unsustainable fish farming system. But between the nutrition, the convenience, and the delicious taste, wild-caught salmon is one Paleo staple that should definitely be making a regular appearance on your dinner table.